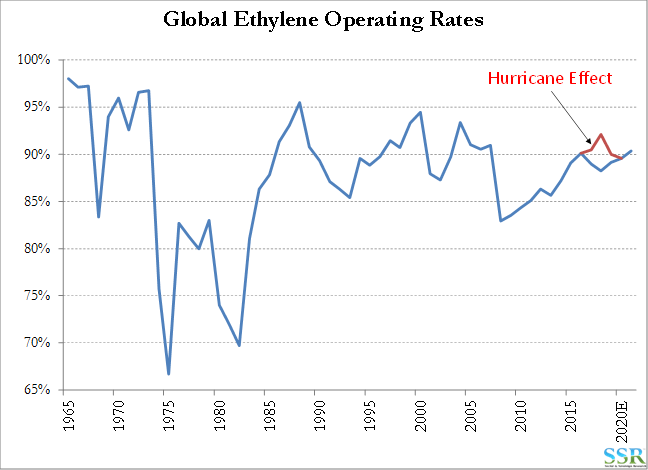 With a further sell down in Bayer’s stake and an improving market for polyurethanes (boosted by housing demand in the US – see below) and polycarbonates, could Covestro mirror the performance of TSE as the float increases and as fundamentals improve? Trinseo was a bit of a rocket ship once Bain sold enough of the stock for the company to make the cut at most investment firms and as styrene and polycarbonate fundamentals improved – see chart. Bayer has sold another almost 10% of Covestro (1COV – on the German exchange) this week and now holds less than 40%. Bayer WILL sell more as it gears up to buy Monsanto. 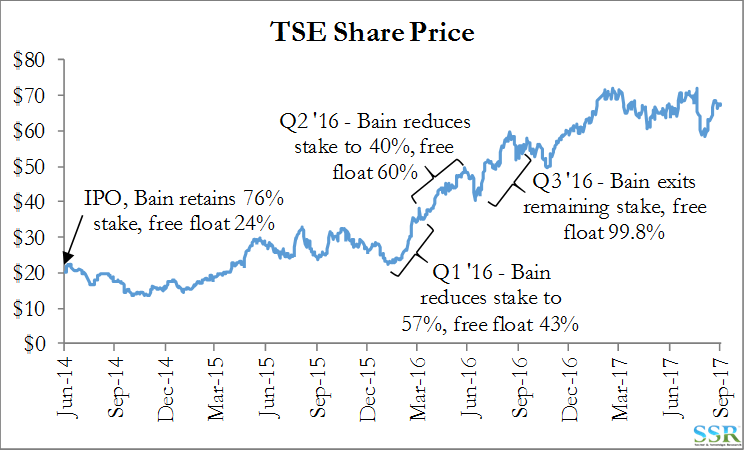 Covestro could have the same dynamic as TSE – increased free float coincident with improved fundamentals. The stock is inexpensive and probably perceived as less cyclical than TSE, because of TSE’s styrene exposure. Looking at the range of estimates and opinions on the stock, it appears poorly understood. There is some risk if propylene prices spike on the polyurethane side, but polyurethane prices would likely move in tandem. TSE was driven by styrene and a general underinvestment in the space leading to demand eventually catching supply. Polyurethanes and polycarbonates are both slow growing materials that have seen minimal recent investment and could have the same sort of recovery. Both Covestro and TSE are trading at low multiples of both earnings and EBITDA. Lost production – we underestimated this element and now expect lost ethylene production to be as much as 1-1.5 million tons – perhaps higher as we still have a couple of producers who have not quantified – most notably ExxonMobil. LYB has indicated that it’s ethylene system will not be running fully until early October. Capacity delays – CPChem may be as much as 6 months late, though the damage assessment at Cedar Bayou is still on-going. Dow will likely have some delay at Freeport as the plant – going through start-up – had to be shut down during the storm. No word from Exxon. We are not changing this estimate. Increased demand – may be a little lower than our initial estimate given that Irma caused less damage than expected, but we don’t think the change is material. Inventory – we believe we underestimated here as the lost ethylene and polyethylene production in the US Gulf is higher than we expected and comes at what is usually a seasonally stronger part of the year. We expect to see “overbuying” because of fear of shortage. Our revised table and chart are shown below – it is not a major change from what we published on Monday but it is directionally more supportive of a recovery for US ethylene and polyethylene pricing and for this to carry through 2018. We think that the ethylene rally begins NOW, and extends into 2018 and possibly 2019. We would buy LYB, WLK and DWDP in US, Braskem, SABIC, and the Korean names. Braskem is the cheapest source of global ethylene exposure today, but carries the associated country/currency risk. General clean-up: Trucking, trash sacks (polyethylene), detergents – JBHT, ODFL, (maybe PCAR and CMI), DWDP, LYB, POL, DWDP again on the detergent side, but also OLN, and others. Infrastructure – Roads/Rail etc. – road repair, rail and rail car repair, power restoration, temporary and permanent. TRN, (some increment for CAT and DE), GNRC, GE, BGC, DWDP (Wire and Cable), LYB, VMC, WLK, AA. Tools – replacement and demand boost: SWK and SNA. We published the table below in work on Monday – many of the names overlap with those highlighted above. 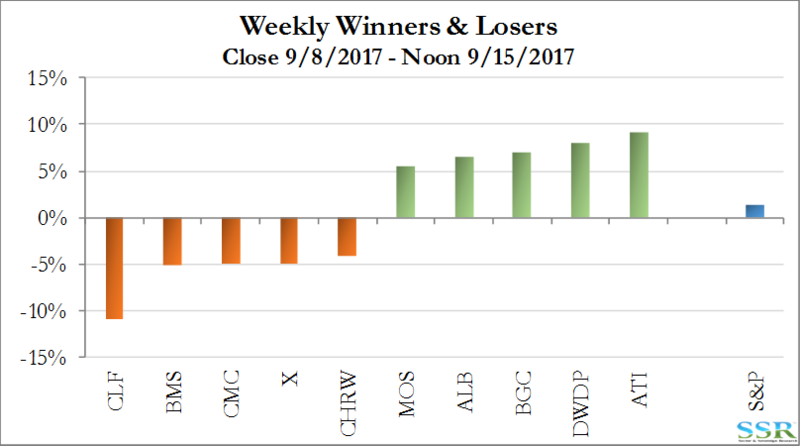 DWDP has very quickly made peace with its activist contingent this week, moving a material portion of what was originally slated for the Material Science business to the Specialty business – see recent research. Our recent bullishness with respect to earnings potential was based on a combined pro-forma, not on the proposed split, so our stance is unchanged and if the new model can create an incrementally higher aggregate multiple for the business once separated then even better. We think that the next catalyst will be a statement with respect to shareholder returns this year and next – an interim dividend policy – pre-split – unlikely to be lower that the higher of the two companies previously on a payout basis, with the possibility of a one-time boost in 2018. While our model calls for substantial buyback, we do not see the company raising debt to do this, as some have suggested, given the need to get capital structures and debt ratings for the separate companies sorted out. We would expect a buyback in 2018 reflecting cash on hand – this could still be substantial, especially if we get the ethylene boost suggested above and earnings and cash flows that come in well above current street expectations. 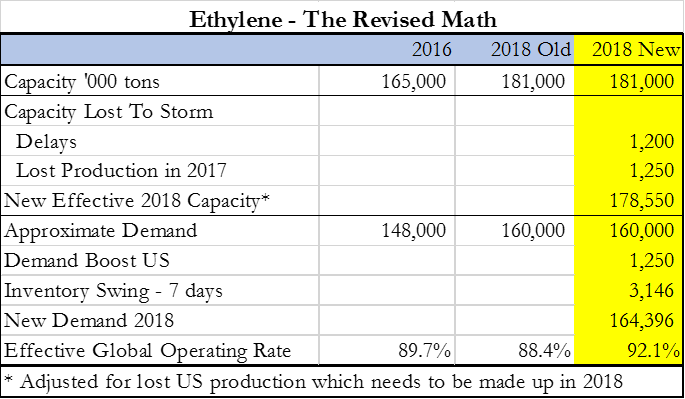 We see upside to the estimates summarized below in 2018 because of ethylene. We maintain our $100 target price for the stock on a 12-18 month view.